If one peruses their televisions, computers, and streetscapes, they can’t help but forget that we have been in the throes of the Christmas season since November. But this form of Christmas celebration, tied so deeply with capitalism, belies the transformative optimism Christmas provided working-class socialists in the Depression, and still today. Much as Pope Francis’ criticisms of capitalism and consumerist Christmas celebrations amidst war offer a call to change, so did the Christian Left seek a new social order in the Great Depression via the message of Christ and Christmas. For them, the egalitarian and socialist ideals of a 2000 year old Humble Nararane Carpenter spoke the society they wished to build. A theology which teaches that God is Mammon’s silent partner would necessarily be suspect in an age of folk upheaval…. Property needs not God to protect it…Jesus announced “Good News”[:] namely, that Heaven is passionately on the side of the people against the despotic tendencies of property; and under that leadership a messianic passion for men is announcing itself. The trouble is the working people at large have not yet come to behold The Carpenter. fundamental changes to our social order…to insist upon the creation of an industrial society which shall have as its purpose economic security and freedom for the masses of mankind; to strive for…a social order which shall be based upon the teachings of the Great Founder of Brotherhood, in accordance with the code of rules laid down by Him two thousand years ago. with its rugged individualism and profit motive, has fostered selfishness, greed and avarice…. It gives the lion’s share to the unscrupulous. It is unfriendly to the Christian spirit of social service…. Its underlying philosophy has well-nigh become an uncritical part of our mental make-up. It uses Christian labels to profit thereby. Clearly there existed a desire in some to dislodge Christianity from capitalism, but where does Christmas fall into all of this? Simply put, Christmas was a time when many such critics stepped back to reflect on the existing world, and offer hopes for a Christian social order. When one December 1930 piece asked, “What Would the Master Say if He Were Here Today,” the answer was that Christ would demand his followers recognize suffering, injustice, and hypocrisy during the holidays. Because while some celebrated with lavish gifts and presents, many had little material or emotional shelter from the harsh realities of daily life. In all this, it was felt by many that the egalitarian “message of the Great Commoner” was being obscured amidst the joviality of a privileged few. One illustration made this point by showcasing wealthy people napping after a feast. Behind them, are ghosts of neglected children, elderly, and the sick. The lesson was clear: “We have become aware of the need to do our good deeds more regularly, more systematically. Not without warrant is there a general suspicion that the contrast between Christmas benevolence and the starvation of body and soul which darkens civilization at other times reflects sadly upon our intelligence.” It was the case that traditional Christian charity—epitomized by a power imbalance between the donor and recipient—could not address the rotten core of contemporary society. There was a strong sense that charity, as we have seen with contemporary philanthrocapitalists like Bill Gates and Mark Zuckerberg, subverted social change. 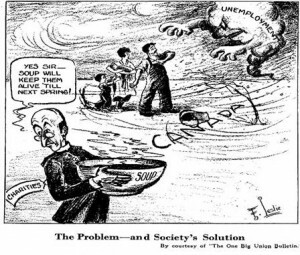 An excellent example was a December 1927 cartoon titled “The Problem – and Society’s Solution.” It portrayed a storm labelled “unemployment” bearing down upon a working-class family. In the foreground was a clergyman with a bowl of soup and a tag on his arm titled “charity.” Speaking to a figure off-scene, he says “yes sir – soup will keep them alive ‘till next spring.” The message: charity as practiced by the rich and conventional Christian institutions was meant to maintain subsistence and subservience, all in order to discourage the radical message of Christ from shining through. These messages and authors may seem disconnected from us nearly a century later, but in a Canada still substantially Christian, yet wracked with inequality, poverty, and economic uncertainty, the examples have a multi-faceted applicability. The ties between social justice and faith are still deep in Canada, and people conceptions of a better tomorrow, while undoubtedly based in material objects, are often underpinned by spiritual hopes and dreams. In this way, we need to see religious practice and philosophy for the complicated social project that it is. While in Canada Christian edicts have been used to oppress, placate, marginalize, and exclude, those same edicts, in addition to the contributions of other religious and spiritual denominations, have been integral in creating a more just and humane society. Christo Aivalis is an Adjunct Professor of History at Queen’s University. His SSHRC-funded dissertation examined Pierre Elliott Trudeau’s relationship with organized labour and the CCF-NDP, and is being published by UBC Press. His work has appeared in the Canadian Historical Review, Labour/le Travail, Canadian Dimension, Our Times Magazine, and Rankandfile.ca. He is a dedicated activist within the NDP, various labour bodies, and municipal Governance, while also being a media contributor to multiple sources including the Toronto Star and CBC. J.J. Holmes Jr., “Christianity and Industry,” Trades and Labor Congress Journal, July 1930, 38. L. Eric Wethey, “Thou Shalt Steal,” The Canadian Railway Employees’ Monthly, March 1930, 62. Charles Dickie, “The Brotherhood of Labor,” The Trades and Labor Congress Journal, March 1934, 22–24. Rev. R.E. Gosse, “Standards and Incentives of a Christian Social Order,” Labor World/Monde Ouvrier, 31 August 1935, 5. Bernard Rose, “What would the Master Say if Where Here Today?” Labor World/Monde Ouvrier, 20 December 1930, 3. 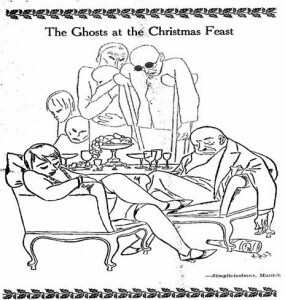 “The Ghosts at the Christmas Feast,” The Canadian Unionist, December 1930, 175; “Good Will,” The Canadian Unionist, December 1935, 179. F. Leslie, “The Problem – and Society’s Solution,” The Canadian Unionist, December 1927, 98. “Good Will,” The Canadian Unionist, December 1935, 179. “Christmas,” The Canadian Unionist, December 1930, 174.